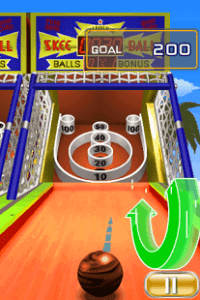 Skee-Ball for Android is an an arcade Skee-Ball game that brings back memories of the good old arcades. It is one of the very best arcade games at this moment for Android. 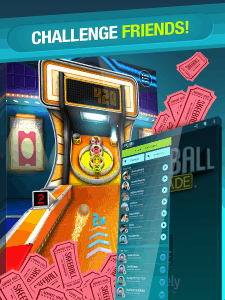 In Skee-ball Arcade you will have to roll balls against your competitors in order to gain a better score, classic skee-ball experience. Some people call it the most authentic skee-ball experience available nowadays and this is one of the reasons we will provide you with an insight on Skee-Ball Arcade. 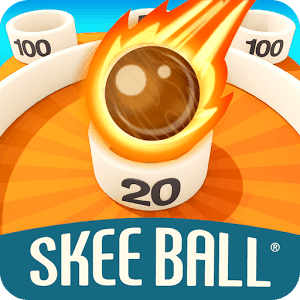 Firstly, Skee-Ball Arcade is free and you can download it from the Google Play Store. Before playing it you have to go through some usual steps, like playing a short tutorial or creating an account either by connecting with Facebook or providing an e-mail account. After these you can go and enjoy the full Skee-Ball Arcade experience with new boards, explosive power ups and tournaments in which you will compete against others. In the game you and your opponent will throw balls into across the table with the purpose of placing them into special holes. Each hole grants a number of points, written next to it. There are barriers next to the holes as well and one should throw to avoid these as well. The two players take turns throwing and at some point your patience might be tested waiting for your opponent. Multipliers also make an appearance and they pop-up on lanes sometimes. If you successfully swing your ball on the specific lane you get double points when it lands in one of the holes. Bonus Rounds are awarded for throwing in specific holes and they should be used at the end of each round. The same goes for Tickets which are gained after a round, in various quantities, depending on scores. Exchange them for new Skee-Ball Tables whenever you can. To help you with your progress, the developers have introduced power-ups as well. These power-ups will give a number of benefits. Some will let you throw three balls at once, some will cause your ball to explode in a number of different ones and others will introduce a multiplier on every lane. Awards are granted every now and then and make sure you keep an eye on them. They are very useful for gaining tickets. You also don’t have to wait until your ball sinks and you can throw another right after it if you refer to speed things up a little bit. The game can be played by tilting the device but if you are not quite experienced with this it is advisable to avoid it for a while. After reading all of this you can say you got your first taste of Skee-Ball Arcade. All that remains for you now is to download the game from the Play Store and enjoy it. And tell us about your experience.